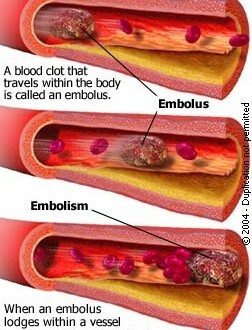 An embolus is foreign to the bloodstream which lodges in the artery causing obstruction to the blood flow to the affected part of the body. This is a thrombus and the commonest source is the heart – myocardial infarction (1/3 cases), mitral stenosis, cardiac arrhythmias (AF) and aneurysms. These may lodge in any organ resulting in ischemia and symptoms. In the brain the middle cerebral artery is most commonly affected resulting in hemiplegia or TIA. The embolus may lodge in the central retinal artey giving rise to fleeting blindness - amurosis fujax. Occlusion of the intestinal arteries gives rise to gangrene of the bowel. Blockage of the kidney arteries - local loin pain and blood in urine. Lungs – pulmonary embolism which could be fatal and if patient survives then hemoptysis or dyspnoea may occur. Lower limbs – sudden pain, pallor, pulseless leg, paresthesia and peresis. The occclusion due to embolus must be differentiated from atherosclorotic occlusion where it is sudden. Embolic occlusion is an emergency. In limb occlusion there is pain, pulselessness, pallor, paresthesia and peresis. The limb is cold and immediately the toes cannot be moved. There is no previous history of claudication and there is a source of embolus. The limb becomes cold mottled blue and white discolouration. The femoral pulse may be present and even bounding because of the obstruction. There is propagation of clot proximal and distal to the thrombus. Immediate heparin 5000 u I/V prevent the propagation of clot and maintains the patency of the distal vessels till the clot is treated. Relief of pain is essential as it is very severe and constant. Embolectomy or thrombolysis are the available treatments. Done under local or general anesthesia. Clot is removed by a Fogarty catheter inserted via an arteriotomy. It is important to look for back bleeding. The balloon catheter is passed beyond the clot and balloon inflated. The clot is pulled out. The procedure is repeated till there is good bleeding from both sides of the opened artery. Post-operative anticoagulation with I/V heparin is started and continued long term with warfarin. If ischemia is not so severe so as to need immediate surgery then intra-arterial thrombolysis is possible. It is more valuable if we suspect thrombosis. It is the treatment of choice in many occasions. At angiography a catheter is left within the clot and a thrombolytic agent is infused. In addition 250 u of heparin is given I/V. The common thrombolytic agents are streptokinase, urokinase and Tissue Plasminogen Activator (TPA). TPA is fastest acting which is needed. Whatever drug is used regular angiograms are carried out to see extent of lysis of clot. Using streptokinase lysis is done for 48 hours. With TPA lysis takes 24 hours. A new catheter – pulse spray works in 6 hours. Thrombolysis should be cancelled if there is no improvement on angiography. This procedure is contraindicated in cases of recent stroke, bleeding tendency and pregnancy. Happens accidently when the neck or axillary vein is opened or may be the cause of death in cut throat. Air passes into the right atrium where it is churned into foam and then passed via the right ventricle into the lungs where it causes air locks in the pulmonary artery causing right sided heart failure. The patient is treated by placing the patient in trendelenburg position so that air rises to the lower half of the body and turned on the left side so that air floats at the apex of the ventricle away from the pulmonary artery. Oxygen is given to counteract hypoxia and to help the excretion of nitrogen. In serious cases aspirate the right ventricle with a needle which is passed upwards and backwards from below the left costal margin. If this fails the heart is rapidly exposed and aspiration is done under direct vision. Air may enter the left side of the heart at open heart surgery or patent foramen ovale and embolise to the coronary and cerebral arteries. The condition is generally underestimated and seen following fractures, trauma. The fat may come from the bone marrow or adipose tissue. It may be metabolic by the collection of chylomicrons. The symptoms appear 24 – 48 hours after injury and are most commonly cerebral or pulmonary. In the cerebral type patient becomes drowsy, confused and restless and finally comatosed. Pupils become small and patient has fever. In the pulmonary type the patient becomes cyanosed and develops right heart failure. White froth may come from the mouth and nostrils. There may be petechae in the retinae. The sputum and urine must be examined for fat droplets. There is always a fall in Hb and is a constant sign. Petechial hemorrahges often occur. Treatment - oxygen, early heparinisation and I/V low molecular weight dextran. Infected clots or masses of bacteria – cause mycotic aneurysms, fever and infected infarcts. Parasitic emboli - tenea echinococcus. This is used to arrest bleeding from the gut, kidney or lungs. It is used to treat AV malformations by blocking arterial supply and to shrink untreatable tumours. In the wall – subintimal hematoma. Outside wall – compartmental syndrome. In any case of truama one should check pulses in affected limb. Cold, numb cyanosed limb without pulses shows acute arterial occlusion. The commonest cause of arterial trauma is iatrogenic as seen in cardiac catherization. Pre-operative assessment – doing angiography which also tells us of per-existing atherosclorotic disease. Operative procedure – expose the injured artery and look at the posterior aspect of the artery for injury. If the injury is small then a single suture may suffice but if it is more wide spread then resect and do end to end anestamosis. If the injury is more extensive and the two ends cannot be brought together then vein is interposed. The vein must be taken from the other undamaged limb because in the traumatised limb there may be damage to the deep veins and so the superficial veins may be needed to return blood centrally. Never think of spasm as a cause of occlusion. Ischemia after trauma demands urgent action. The results of surgery for trauma patients is generally good as vessels are not diseased. Per-operative angiogram is necessary. Stabilization of fractures is a must before vascular repair. Here the main artery is compressed due to oedema and hematoma in the fixed fascial compartment of the leg. This can cause distal ischemia and crush syndrome related renal effects. Here fasciotomy is indicated to remove the external compression on the artery.